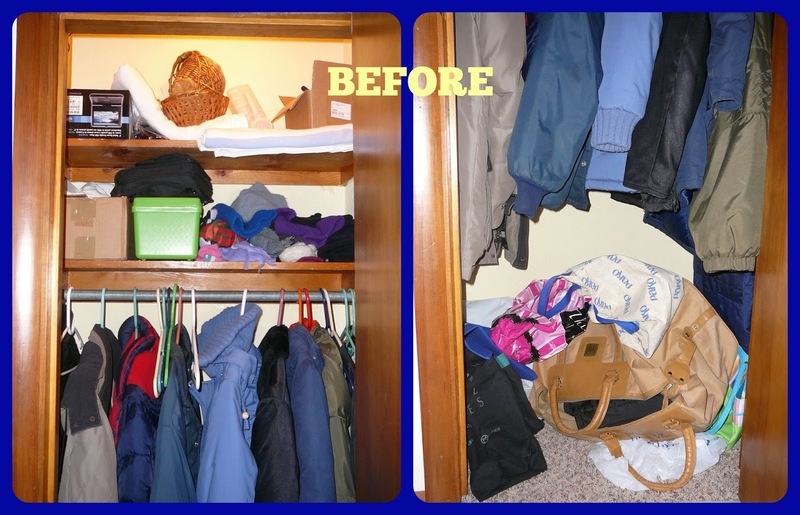 Last year, I took a look in our "in-season" coat closet and noticed it needed some help. 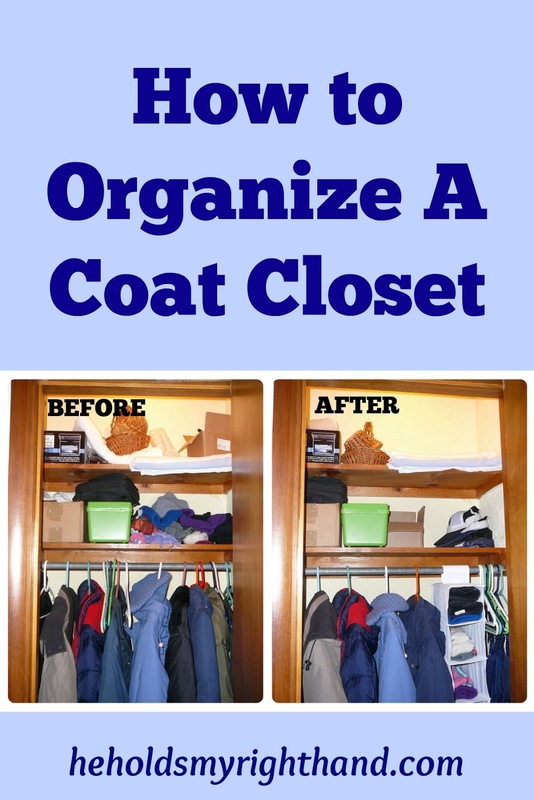 (We have two separate coat closets–one in a storage room that stores the out-of-season items, and an in-season closet near the front door). At the bottom of the closet, there were balls and Frisbees, mixed in with tote bags and many other items that didn’t really have a set place; one shelf at the top held hats, gloves and scarves that were piled up into a mixed-up mess; the second shelf held a number of different items that were crammed together; and, all of the jackets and coats were mixed together in a way that made it hard to pull one out without dragging 2 more along with it. I knew it was time for an organizing job. 1. 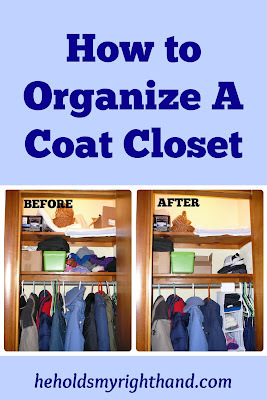 I removed all the hangers, coats and jackets that were not needed for the winter season, and set them aside to be taken to the storage room. At the same time, I went through the coats that had been outgrown and put them into a pile to give away. 2. All of the coats left in the closet were hung into one direction. It may not seem like a big deal to do this, but it ends up looking so much nicer this way. For someone who enjoys seeing things neat and tidy and having everything in an easy-to-find manner, it is truly satisfying to see the end result. Just try it and you’ll see what I mean. 4. 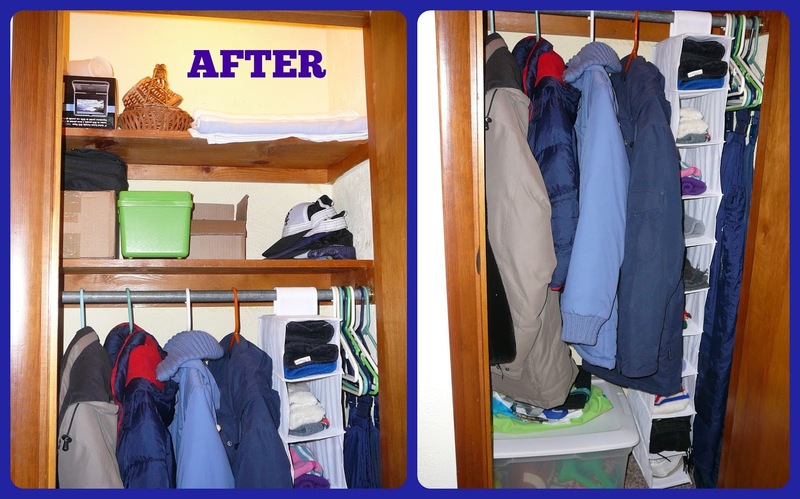 Next, the top shelves were decluttered by removing unwanted or unneeded items. Then, “like” items were placed with other “like” items, and everything else was tidied up. 5. This last step is simple, but important... I threw away the trash, and made sure all of the items that did not belong in the closet were put away into their proper place. Be sure not to wait until later for this step, or it may not get done in a timely manner. Do it right away! After accomplishing all these steps, it was so nice to step back and take a look at the final product. I was very pleased with what I saw and decided I wanted to keep it that way! That is one of the biggest challenges of all, isn’t it? But, at least its a good start!